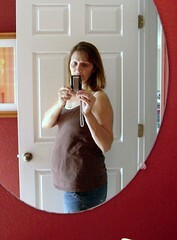 Me, at about 30 weeks. Don't enlarge this one ... I look exhausted, because I am ... and hot, because it's in the 90's again today and we were just playing outside (well, the local bees were playing, the kids were getting stung, and I was trying to get the kids inside and their toys cleaned up without getting stung myself). I may try to take a better picture later, but for now this is it. Babe is doing well. He's measuring right on with a good heartbeat. I'm down about 5 lbs. from my prepregnancy weight, which isn't great but I wasn't exactly thin to begin with so, so far, no one is overly concerned about it. Oh, I haven't told you how the craft show went last weekend. Turnout was great, it was at a huge Baptist church and was attended by a good variety of people, including lots of pregnant women and women with strollers. People were buying ... I saw them with bags and bags of stuff. I, however, sold just two things. :( It just wasn't my day. I did pass out a lot of business cards though, which may amount to some future sales. It was just one of those days ... and I can't help but laugh about it. this is gorgeous and you, my dear are looking great! glad the babe is doing well. sorry about only 2 sales...next time! The quilt is beautiful and so are you! But who ARE these people who are not buying your wares??? I'm just incredulous! They are obviously big meanie poopy heads with no taste whatsoever. So there. 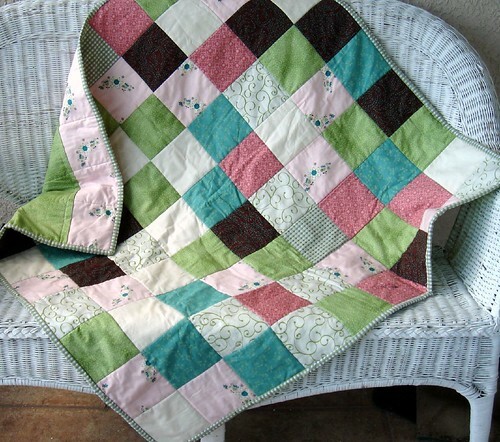 There is something I love about patchwork - just simple squares. I love it. I made one this weekend too. I'll have to show it on my blog when I get it quilted.